Tools of genetic engineering in plants. Part 1 Targets for transformation: Genetic modification of agronomic traits in fruit crops; Genes involved in plant defence mechanisms; Genes selected for their role in modifying post-harvest life; Use of molecular genetics to improve food properties; Nutritional enhancement of plant foods. Part 2 Case studies: Tomato; Commercial developments with transgenic potato; Cucurbits, pepper, eggplant and other vegetables. Part 3 Consumer’s attitudes and risk assessment. Genetic modification is one of the most important and controversial issues facing the food industry. With its international team of contributors, Fruit and vegetable biotechnology analyses its major impact on fruit and vegetable cultivation and processing. The book begins with an analysis of the methods available to the biotechnologist. Part one then considers the range of traits that have been the subject of modification. Chapter 3 discusses the modification of such agronomic traits as fruit quality and resistance to various kinds of environmental stress, as well as the use of molecular markers in plant breeding. Chapter 4 looks specifically at how biotechnology can improve plant defence mechanisms. The following three chapters then consider the genetic enhancement of fruit and vegetable ripening and post-harvest life, sensory properties such colour and flavour, processing functionality, and nutritional quality. Part two includes a number of case studies illustrating how genetic modification has enhanced particular fruits and vegetables, looking at a range of fruit and vegetables such as tomato, potato, melon, broccoli and cauliflower. Part three of the book considers the important issues of consumer attitudes and risk assessment. 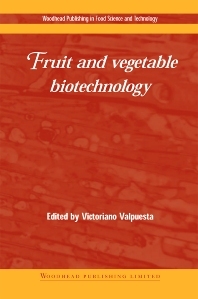 Fruit and vegetable biotechnology is an important contribution to a key area of debate, and is essential reading for those involved both in cultivation and the processing of fruit and vegetables.